Working in helping professions is easily one of the most rewarding and taxing paths we can take. While we carry the sweet victories of our clients with us, we also carry their burdens. Empathy that we bring to the office often has a way of embedding itself in our DNA, and it swiftly becomes a feature of who we are. In fact, it’s likely that you entered into this profession because empathy and a thirst for justice were already traits you possessed. Burnout is real, heavy and can even be insidious. And burnout is a great starting point for understanding secondary trauma or secondary traumatic stress. According to the National Child Traumatic Stress Network, the term secondary trauma refers to the presence of posttraumatic stress symptoms caused by at least one indirect exposure to traumatic material. In other words, the traumatic stories we hear from our clients can cause a trauma response in ourselves. This happens all the time in this profession as we absorb and learn the harrowing details of our clients’ lives. This term can be used interchangeably with the term secondary trauma. It can be a great and approachable term to use with loved ones who may not be familiar with the idea of secondary trauma. Like secondary trauma, you can notice this when you start to experience symptoms of posttraumatic stress disorder. This can be understood as the accumulation of secondary trauma over time. While secondary trauma can occur in just one session with a client, vicarious trauma often refers to an overall shift in the professional’s understanding of the world. After working with client after client, you may notice a shift in your worldview… ‘The world is an awful place’. Or maybe you find yourself becoming emotionally hard to the problems of others. This shift in both your professional and personal life may be a signal that vicarious traumatic stress occurring. Think ‘utter exhaustion’. Burnout does not always refer to indirect trauma exposure, but can be understood as general occupational stress and exhaustion. Burnout is not necessarily unique to helping professions. This is not the same as secondary trauma, but it can often be a sign of secondary trauma. A great way to keep a pulse on your mental health is through understanding the signs and symptoms of posttraumatic stress. Keeping this list of symptoms mentally or physically handy can help you distinguish if it is time to ramp up your self-care routine or visit a mental health professional for counseling. As you read this, did you notice that you have been experiencing several of these symptoms? If so, DON’T PANIC. Just because you match some symptoms does not necessarily mean you have PTSD. Self-diagnosis can be dangerous, so leave it to the professionals. If you are concerned, it may be time to add seeing a mental health professional to your self-care routine! Let this list be a helpful way to indicate if it is time to seek out professional help or adjust your self-care. While it is great to have the ‘book knowledge’ of traumatic stress, it is also important that you recognize it in a personal way. One size does not fit all when it comes to traumatic stress. Because we are all different when it comes to culture, family, coping, and resilience, it is important to remember that not everybody experiences text-book traumatic stress symptoms. The following are some ways that you can get to know how your body and mind begin to display more personal symptoms of traumatic stress. Check your body right now! Where are your shoulders? Are they up by your ears? How is your posture? What is happening in your stomach? Your joints? Your back? Your breathing? Take a moment to pause and really address where discomfort might be coming from. When you focus on that part of your body, where does your mind go? Can you identify the source of the stress? This could be a great way to indicate causes of stress. Journal your personal symptoms. Record what you are feeling in your body, and what has happened that day. This may help clue you in to what type of stress is causing what type of reaction in your body. By knowing how your body reacts, you may be able to add new activity or exercise to your self-care routine. It could be massage, yoga, cardio, swimming, etc. The key here is learning your body and how it responds to different types of stress. Try a Progressive Muscle Relaxation Script. You can find one by a quick web search. Here is a link to an example. Many feel that this exercise helps bring the body to the present and reset the tension in the body. Try a meditation app. There are many applications for smart phones that guide you through meditation and breathing exercise. Many of these focus on bringing awareness to the body. While there are several, a great one to try is the Stop, Breathe, Think App. Check out the book The Body Keeps the Score: Brain, Mind, and Body in the Healing of Trauma by Bessel Van Der Kolk, M.D. This book offers information about the body’s response to trauma and ways to address it. Often our loved ones know us best. A great way to check if you are displaying symptoms of traumatic stress is by inviting your loved ones to give you feedback. This is a delicate area, as tertiary traumatic stress is something that can happen to loved ones. Yes, tertiary traumatic stress exists. It refers to the stress symptoms that arise to those who are supporting the person experiencing secondary trauma. This could be family, friends, children, co-workers, or others that you interact with regularly. Have you noticed that I’ve become unmotivated, or seemingly lazy? Have I seemed quick to anger or more irritable? Do you notice changes in my sleeping or eating? Do I seem to have a ‘chip on my shoulder’? Have you noticed a change in the way I think about the world or myself? Does it seem I have lower self-esteem? Have you seen a shift in my optimism/pessimism? Do I seem ‘on edge’ to you? Feel free to share the list of symptoms with your loved one. *Avoid asking for specific examples that could cause interpersonal conflict. It is also a good idea to avoid asking children for this feedback. Offer education: Explain to your loved one what you know about compassion fatigue. Explain that it is a feature of your profession and that you can buffer the effects of it by adding to your self-care routine. Share what your plan is: Let your loved one know how you plan to address the symptoms. If necessary, you can even ask for accountability. Request that you only receive feedback when you ask for it: This can help avoid interpersonal conflict. It can be very easy to muddle personal stress with professional stress. You can attempt to keep this separate by creating this boundary. When you enter into a check-in with your loved one, remind them that it is not a time for them to unload their frustrations on you. Keep it about constructive feedback as much as possible. You can also set aside a specific time every week/month for a check-in, or maybe choose a word that indicates that it is time to check-in. Remind your loved one that it is not their job to treat your secondary trauma: If your loved one is feeling burdened by the thought that they need to “fix it”, it may be time to seek a mental health professional. It is actually the job of a mental health professional to work through this with you. Do not bring extra stress to your relationship with your loved one, and instead seek help! You do not have to do this alone. How do you feel about going to work? Has this changed for you? If your attitude about work has taken a turn for the worse, check in with yourself. Think about the difference between burnout and secondary trauma and see if you can distinguish what is going on for you. What is your commute like? Do you perhaps have road rage that you did not have before? Ask yourself where that is coming from. Could this be the effects of burnout or secondary trauma? What is the first think you think of when you wake up in the morning? This is a great self-check question. Keep a journal or mental tabs on this question to see how your days are impacted by the first thoughts of your day. Does it impact your feelings? Your attitude? Note how this changes throughout the days, and look for trends and patterns. What else has changed? Try and stay tuned in to what has changed about your attitude. Listen when loved ones share concern with your attitude or energy levels. Pay special attention to times when you’re not feeling like yourself. There is not much to say here other than, do not neglect your physical health. Many people experience physical health problems when experiencing traumatic stress. If you notice that you are sick more often than you were before, there may be something wrong. Pay attention to illness and pain! See your doctor for a check-up and stay on top of your physical health symptoms. 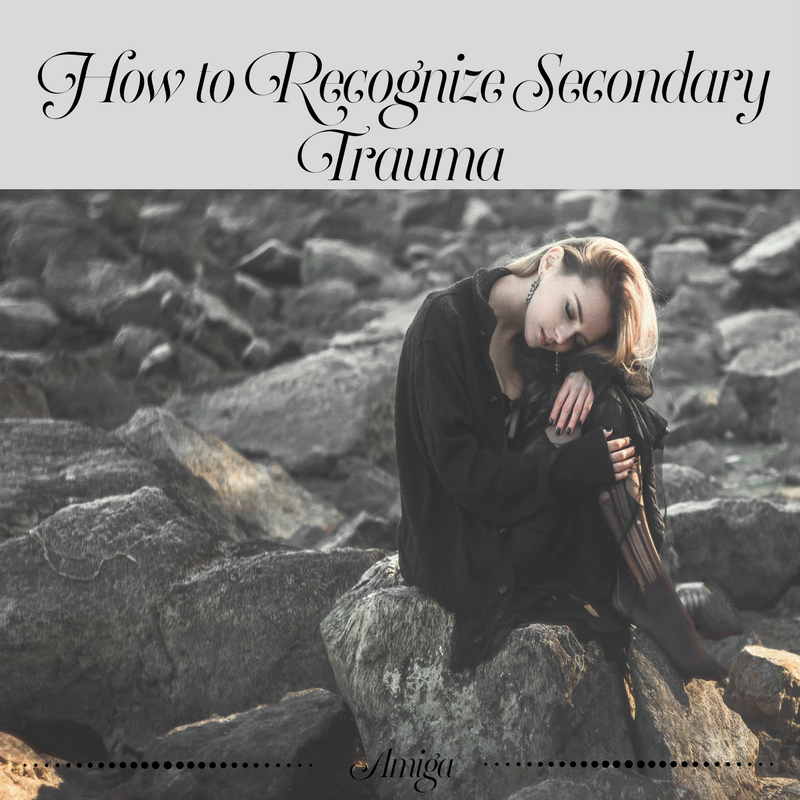 The first step in healing secondary trauma is recognizing. By taking the time to learn you can help prevent, heal, and maintain the effects of secondary trauma. Do not feel afraid to reach out for help from a mental health professional so you can have a safe space to share your story too.